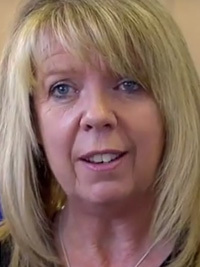 Nicky Mitchell works as a Learning Support Assistant at a primary school in Maidstone, Kent. She has recently taken part in Citizen Maths, a free online course that that aims to improve use of maths in the workplace, in order to boost her confidence and overcome the symptoms of maths anxiety she experienced. I have supported pupils in a primary setting since the mid-eighties, initially in a special school, providing education for children with moderate learning difficulties. After several years, I moved on to work alongside a specialist nursing team where I supported adults with behavioural issues living in the community. The team worked hard but I found that long hours alone in an office did not suit my personality and I re-joined the special school where I’d previously worked. I definitely preferred being in a classroom setting. It was during this time that I became restless and felt that I needed to try other things in life. My children were older and my daughter had set off on her first world adventure. I, on the other hand, went to work in a children’s home as a support social worker. Unfortunately, during this time a colleague and I were assaulted by two young residents. After this I decided to leave – I didn’t take that sort of behaviour at home and I certainly wouldn’t tolerate it in a working environment. Meanwhile, at home, my personal life was unravelling and my husband and I, sadly, divorced after twenty-three years of being together. The following months led me to the school where I currently work. The pupils have inspired me to develop my own understanding and gain a greater depth of knowledge in a subject where I had always thought I had a reasonable grasp – maths. 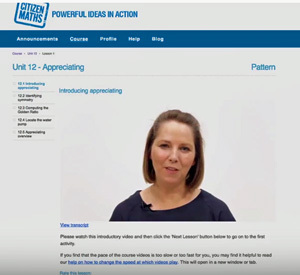 So, last summer, I decided to participate in a free online learning course – Citizen Maths. It had been introduced to me by a colleague at work who had encouraged me to broaden my understanding of maths – an area of learning that produced a multitude of stress-related physical reactions throughout my whole body. These symptoms were real, powerful and had effectively held me back in all areas of my life. Whilst attempting the course, I struck up correspondence with Seb Schmoller, a project director involved with the creation of the programme. He expressed an interest in my comments about maths anxiety – a condition which I believe is felt by many people. He sought my permission to post my comments on the Citizen Maths Twitter feed in order to help others by raising awareness of the problem. Due to the fact that the pupils I’m working now with have shown great improvement in their learning, I thought it was time to find myself a new challenge in Citizen Maths. It certainly has tested me, but it was just like having a tutor in my home working at my pace and my level, and the more I progressed, the more confident I felt of my own abilities. However, most importantly, I am now better able to understand myself – what held me back in the past, how I can respond differently now and why it’s important to love yourself. The main thing is that it helps you to understand that you can do something that you perhaps think you’ve been unable to in the past. Life will continue to present opportunities, but I shall endeavour to grasp each one with a new-found confidence. Maths used to be a battle for me, but now it’s just a challenge. Sometimes things might get difficult, but it doesn’t matter because I’ll cope now!